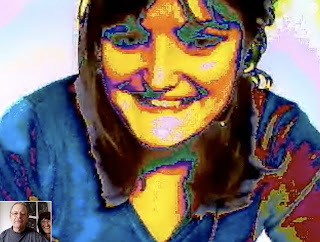 Carrie's Skype webcam has gone psychedelic. Some chaps came round filming in our bario. They put some new flowers in our window and asked me to sit on a chair by the front door while they filmed. I had to sit, turn the pages of a book then look at the camera and smile. Sit - Pretend to read - Turn pages - Look up - Smile . . . phew! Plus a glass of red wine followed by a square or three of 85% chocolate. I don't think neolithic man had nice re-cycled portugese green glass to serve his wine in, but still. I'm hoping to sell my vintage, circa 1988, Jean Paul Gaultier pour Gibo men's wool suit. A real collectors item but also still very wearable. The shape, the design, even the humour of this suit is in the unmistakable style of the l'enfant terrible of French fashion, Jean Paul Gaultier. Iconic late eighties Gaultier design with big square shoulders. Very dark blue wool with an interesting lining. Single breasted jacket cut to be worn open. Beautifully made (in Italy) and still in excellent condition. 33 inches from collar to bottom, chest about 40 inches. Two patch pockets at waist, breast pocket and an inside pocket. Three metallic grey jacket buttons. Matching cuff buttons which are unbuttonable. Extra details, lapel buttonhole plus a loop hanger on the back. Contrasting ornamental art deco style stitching on front and back, lapels and pockets. Something more to make you smile; the inside lining (rayon?) has been screen printed with a silver and black 'skeleton' motif. The backbone is in the middle and arms at each side, a little Gaultier joke, I suppose. Pleated trousers approx 32 inch waist, 28 inch inside leg. Could be lengthened by couple of inches. Button fly. Hidden belt tunnel. Italian style side pockets. One rear pocket. I bought this suit at Jones in Floral Street, Covent Garden, London in 1988. I've worn about half a dozen times. Recently dry cleaned. A Gaultier suit from the same era can be seen in the Costume Institute of the Metropolitan Museum of Art, New York.